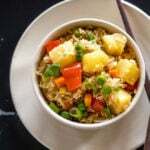 Want to try something different with paneer? 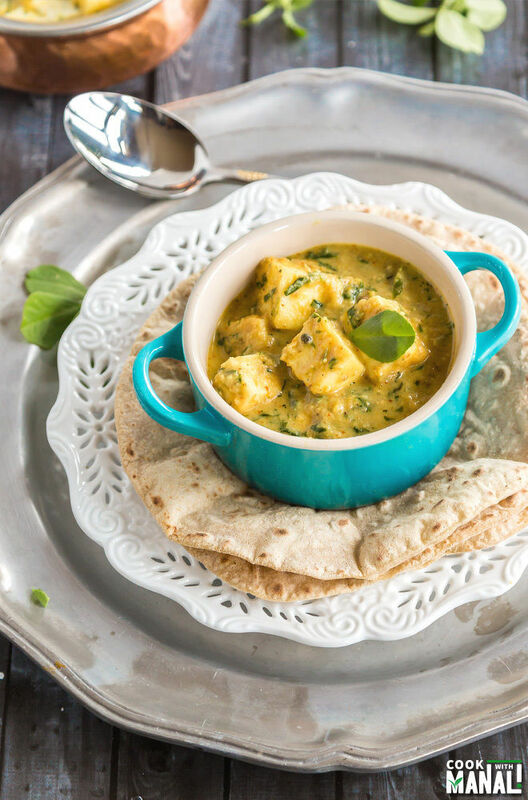 Then try this creamy Methi Malai Paneer. 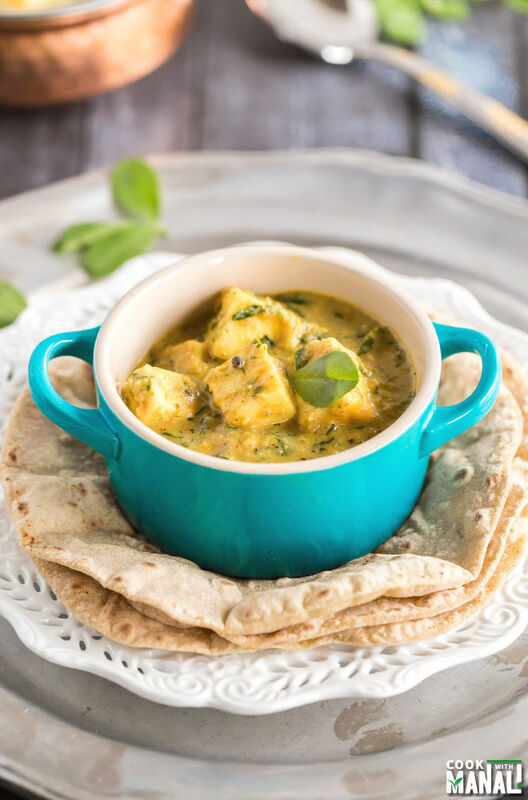 It is a wonderful mix of paneer with fresh fenugreek leaves and tastes great with any Indian bread! Considering how much Indians love paneer, it’s obvious there are tons of paneer recipes. Some tried and tested, some old favorites while some very modern and innovative. Doesn’t matter which category the dish belongs to, as long as there’s paneer in there trust Indians to gobble it all up. Even the non-vegetarians who wouldn’t eat veggies otherwise are more than happy to turn vegetarians if you serve them paneer. So this time around I wanted to make something different and when I spotted fresh methi leaves (fenugreek leaves) at the Indian grocery store, I knew I was going to make Methi Malai Paneer. The literal translation for these words is Methi = fenugreek, Malai = cream and Paneer = as you all know is Indian cottage cheese. So basically this is a creamy curry made with methi and paneer and it’s so good! I don’t think methi is popular here in the US, I mean I have never seen it at regular grocery stores. However it is quite popular in India, especially during winters. We get fresh methi leaves during winters only and it’s used in a number of recipes. 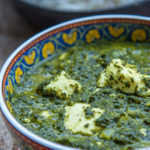 Methi has a slight bitter taste so the malai in methi malai paneer complements it perfectly. We also make lot of methi paratha and dishes like aloo methi, methi matar malai etc etc. Writing all this is making my mouth water because I am really craving for methi paratha now, I absolutely love it! Anyway methi is used in dry form very often in Indian recipes. So your favorite butter chicken or paneer tikka masala will most likely have some garnishing with crushed dried methi leaves. We call it kasuri methi and it imparts a wonderful aroma to the dish. In this recipe I have used both – the fresh methi leaves and also the kasuri methi. Of course the dish is primarily made with fresh methi but adding little dried methi at the end really enhanced the flavors. This curry is really creamy and made with onions and cashews. One thing which I have noticed is that using roasted cashews really makes the curry even more wonderful. So if you can, use roasted cashews here. 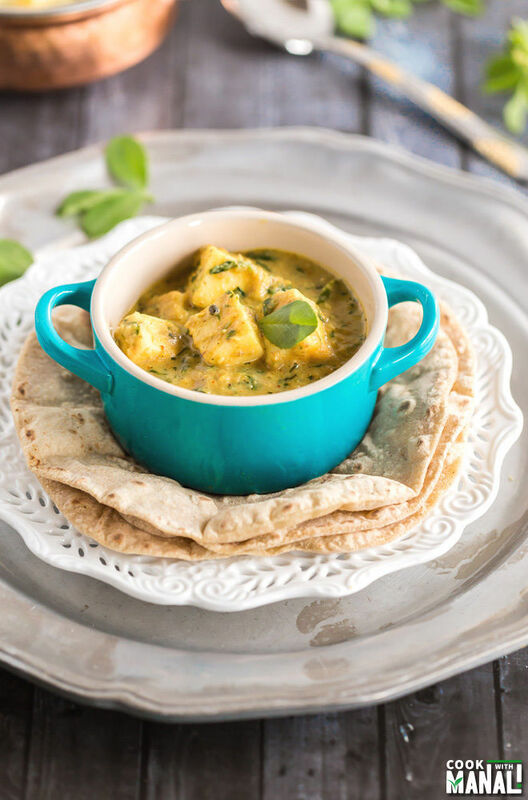 Serve methi malai paneer with any Indian bread, it tastes great with plain paratha! As you can see from the pictures, I enjoyed it with my simple rotis. To a pan on medium heat, add 1 cup water, roughly chopped onion, ginger, garlic, cardamom pods (I crush them before adding), sliced green chili and cashews. Simmer for 15-20 minutes on medium heat. Onions will be really soft by then and almost all water would have evaporated. Remove pan from heat and let the mixture cool down a bit. Grind to a smooth paste using your blender or food processor. You don’t need to add any water here since the mixture already has little water it in and will grind quite easily. Set aside. Add 2 tablespoons ghee in pan on medium heat. Once the ghee is hot, add cinnamon stick and bay leaf to it. Saute for 30 seconds or till you get a nice aroma. Now add the ground onion-cashew paste. Cook this for 3-4 minutes. 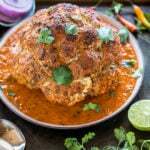 After the paste has cooked for 3-4 minutes, add all dry spices – coriander powder, turmeric powder, red chilli powder and garam masala powder. Also add the chopped methi. Cook the spices with the methi for 2 minutes. Then water , salt and let the curry simmer for 3-4 minutes. This will also cook the methi leaves. Add paneer cubes and simmer for 2-3 minutes. And finally add crushed kasuri methi (dried fenugreek leaves) and sprinkle little garam masala on top. Remove pan from heat. 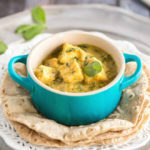 Serve methi malai paneer hot with roti/paratha. * Use roasted cashew in this recipe if possible. If you have raw cashews, simple roast them in pan or an oven before using them in the recipe. 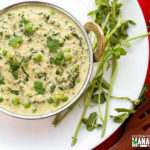 * You can use more cream in this recipe if you like, my methi wasn’t really bitter so 2 tablespoons worked well for me. If the methi you are using is on a bitter side, you can use more. 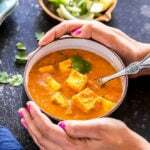 * If using frozen paneer, place the paneer in warm water for 30-45 minutes before using in the recipe. It will stay soft like that. 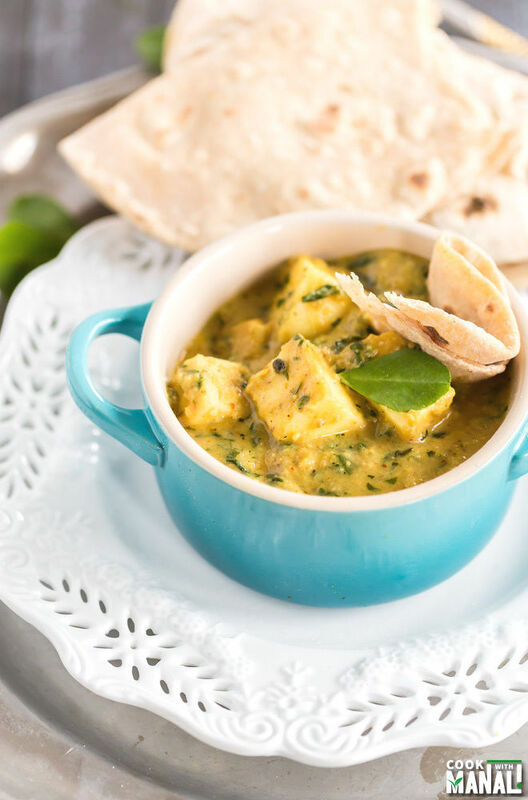 Creamy Methi Malai Paneer is a wonderful paneer curry with fresh fenugreek leaves. Great with any Indian bread! Simmer for 15-20 minutes on medium heat. Onions will be really soft by then and almost all water would have evaporated. Remove pan from heat and let the mixture cool down a bit. 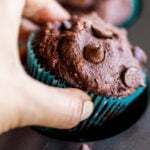 Grind to a smooth paste using your blender or food processor. You don't need to add any water here since the mixture already has little water it in and will grind quite easily. Set aside. After the paste has cooked for 3-4 minutes, add all dry spices - coriander powder, turmeric powder, red chilli powder and garam masala powder. What a comforting and flavoursome meal! I guess it would work with tofu too? I only tried paneer for the first time a few weeks ago, but I love it and always looking for new ways to try it too. This is such a gorgeous paneer dish Manali, it has so many delicious flavours. It looks beautiful. I definitely need to try this. Pinned! I love that bowl too 🙂 Thanks Gayle! This is a lovely paneer! I want to reach in through the screen. ? And the roasted cashews sound great. Thanks Amanda! yeah cashews are great in here! I have never had methi, but now I am going to look for it! 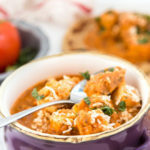 I love paneer and the flavors in this dish are incredible. I can almost taste the flavors now, it looks so good! Girl you make me crave Indian food whenever I come to your blog!! This looks so good and now it’s going to be our dinner tonight!! haha you should make it then Ami! 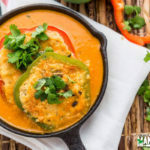 I’m a total sucker for ANYTHING curry so this paneer is right up my alley! It seriously looks so cozy and definitely perfect for a weeknight dinner! Thanks Sarah! It’s delicious if I say so myself! Okay, this is one paneer recipe I must make! It looks delicious, Manali! !